Heat oven to 350°F. In small bowl, mix cookie crumbs, 1/4 cup sugar and the butter. Press mixture in bottom and 1 1/2 inches up side of ungreased 10-inch springform pan. Bake 10 minutes or until set. Cool 20 minutes. Meanwhile, in small bowl, mix coffee granules, water and vanilla; set aside. In large bowl, beat cream cheese with electric mixer on medium speed until light and fluffy. Add 1 cup sugar; beat until very soft and creamy. Beat in cinnamon. Beat in 1 egg at a time just until well blended; do not overbeat. Add coffee mixture; mix well. Pour into cooled baked crust. Bake 45 to 50 minutes or until set. Meanwhile, in small bowl, blend sour cream and 3 tablespoons sugar. 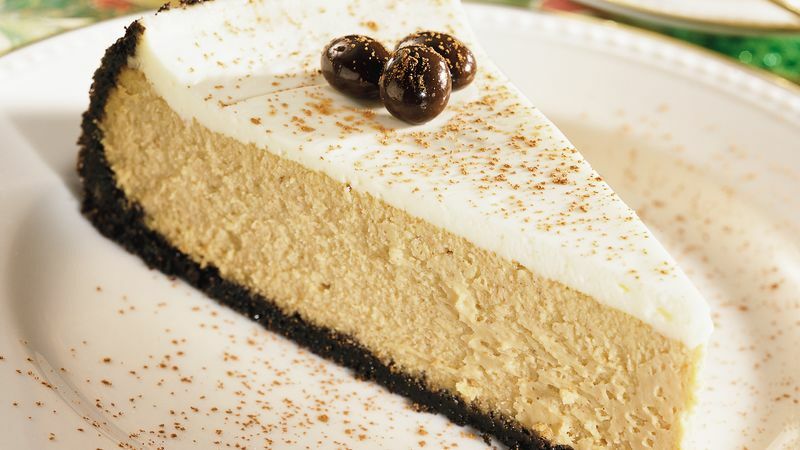 Spread sour cream mixture evenly over top of cheesecake; bake 10 to 15 minutes longer or until sour cream is set. Cool on cooling rack 1 1/2 hours. Refrigerate before serving, at least 3 hours or overnight. Garnish with chocolate-covered coffee beans. Sprinkle lightly with cocoa. Store in refrigerator.